Reflecting lights on the Final Four court had fans seeing every color in the color spectrum on the floor. We've been big fans of the NCAA Tournament choosing to mix up the floor design after a few years with the very bland and sanitized black-and-blue design. 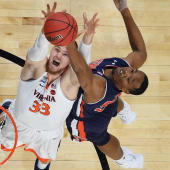 The unique designs at different sites have been a great addition to the way we remember the "where were you moments" the NCAA Tournament is so great at providing. 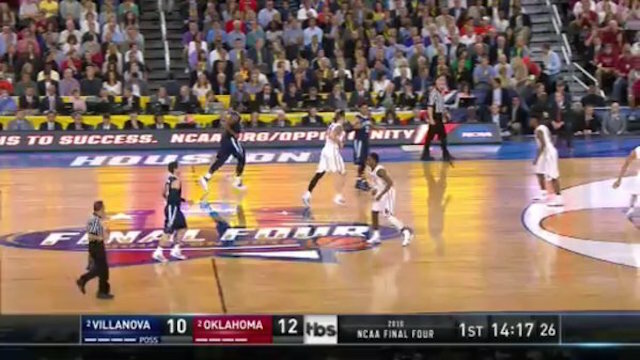 But something about the camera angle, floor design, lighting combination put viewers in an odd spot when Villanova-Oklahoma got underway. The reflection of the NRG Stadium lights, along with the reflections on the Jumbotron, has given the audience at home a full view of the color spectrum. Deadspin's Timothy Burke pointed out that it's likely a result of different camera angles, as the Team Stream feeds seem to be glare-free in comparison. It appears the stadium blacked out the ribbon boards surrounding the stadium to prevent the glare from continuing and it looks to be working, as Deadspin points out.